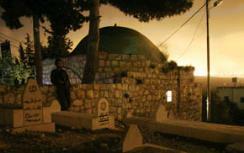 More than 10,000 Jews prayed at Joshua's Tomb on Thursday night. PA Arabs accused of defacing the site. More than 10,000 Jews prayed at Joshua's Tomb in Samaria on Thursday night to commemorate the anniversary of the Jewish leader's passing. Joshua, a prophet, took over the position of leader of the Jewish people from Moses, and led the Jews into Israel. The first people to arrive at the site were horrified to discover that the tomb had been desecrated by Palestinian Authority Arabs, who had left graffiti praising Arab nationalism and denigrating Jews. IDF soldiers brought white paint and helped worshippers cover the offensive graffiti. PA Arabs have desecrated the tomb on several occasions, sometimes going so far as to set the historic site on fire, but in recent months the tomb has been kept in good condition due to increased IDF protection. Organizers noted that participants in Thursday's prayer session included all types of Jews: men and women, Israelis and visitors from abroad, secular, traditional, religious and hareidi-religious. Participants were guarded by the IDF's Ephraim Brigade. Among the participants were students at the Yakir elementary school, who celebrated their completion of the Book of Joshua along with their families. At 1:00 a.m., worshippers came together for a mass recitation of the Aleinu L'shabayach prayer, a prayer that tradition says was composed by Joshua as the Jews conquered the land of Israel. Several noted rabbis, among them Rabbi Elyakim Levanon and Rabbi Yitzchak Ben-Shachar, took part in the recitation, as did Samaria Council head Gershon Mesika and Member of Knesset Michael Ben-Ari. Mesika noted that the number of participants was larger than that of previous years. “There's no doubt that this is a record... It warms the heart to see secular Jews, religious Jews and hareidim coming together to Joshua's Tomb and connecting to our heritage, to the Jewish people's first 'chief of staff,'” he said. Joshua's Tomb is located in the Samaria village of Timnat Heres, as recorded at the end of the Book of Joshua. The village is now known as Kefer Hares, and is under the control of the PA. However, the IDF allows Jews to enter on occasion in order to pray at the tomb.